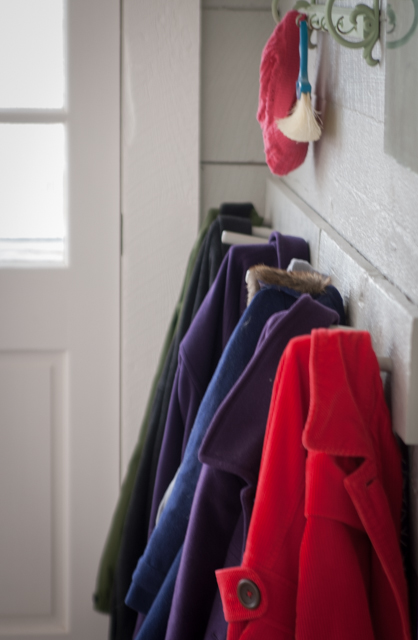 Here are all our coats, which accompany us for every outside moment, unlike during other winters. Other years, we'd just dash to the car, knowing it was warm from all the sun pouring in the window glass. Ho, not this year! In fact, we almost need a coat to be in the sitting room (above). We've all pulled back into the center of the house around the stove, away from the windows and the walls. Little piles of books and stitching all around the fire, cats everywhere, scraps of bark on the floor. And where, seriously, are the daffodils? It makes sense to me that you are having such cool conditions. We are having terrible heatwaves on the other side of the planet in Australia. I'm not alone in looking forward to the change in seasons this year. Yes, indeed we are having a really cold winter! I have to admit that it wears on me-I try to look for the beauty of it, but I'm needing a bit of sunshine and warmth. I am so looking forward to May sunshine and flowers! Yeah, it's cold. What is Felix's opinions of global warming? And in our neck of the woods it's unusual for snow to stick around long and it's piled everywhere. We'll need dump trucks to remove it from parking lots if we get more! Now you know how those of us in the North live. ;) The snow is still up to our knees and the mercury is still in the negatives. Farrah, apparently the models they ran in high school point to another ice age :) Time will tell! It's February 8. It is *only* February 8. I have been trying not to think about this.....what a cold, cold winter this has been!! Spring always comes again. Sooner rather than later, I hope. I'm sorry for all you cold ones. Up north, it hasn't been anything out of the ordinary. We've had a couple of spells in single digits, but that isn't unusual in CT. And not any more snow than usual. so far. Maybe I've slipped a whole year or something, but do you still have your visiting exchange student? Wasn't he/she from a *warm* climate? How is he/she doing with your cold snap? We're hovering around zero these days. Hey, that's better than minus 10, 20 or 30, right? I suppose you already know this, but just in case - it helps to layer - as in, put a cotton tee on, then a sweater, then a sweatshirt, then a jacket - keeping them all a tiny bit loose, so as to allow some space to retain body head tucked inside the layers. Happy fireside cozy times. Nice, sharp picture. I like it. Your description reminds me of a scene from the Ingalls' home in The Long Winter. Hope it warms up soon! Our Saudi Arabian student was only here at the house until October--her mother came over to join her and they have an apartment in town together. She LOVES cold weather (shaking my head unbelievingly). Her mother doesn't get out much though--cultural and bad knee issues make her prefer staying in. Here in the Emerald Isle of Ireland weather is chilly and we've had a few snow showers, but we have had snowdrops, crocuses and daffodils since the end of January!